Julianne Moore does a terrifying impersonation of the former Alaska governor. The makers of HBO’s Game Change have compared the story of Palin’s selection to Pygmalion, but a more useful correlative might be Frankenstein. This is an account of a group of people who, in attempting to revive a moribund campaign, created a personality who took on a life of her own. You might ask why the events surrounding Palin’s elevation to the ticket—which take up fewer than 80 pages of John Heilemann and Mark Halperin’s 400-plus-page chronicle of the 2008 presidential campaign—should be the film’s focus, especially now that Palin has momentarily retreated to the Alaskan wilderness. With the 2012 election looming, the sections that concern Obama’s strategizing are more relevant. You might also ask why it’s useful—or necessary—to see history so recent reenacted, with such instantly recognizable figures as John McCain and, more briefly, Joe Lieberman played by such distractingly miscast actors as Ed Harris and Austin Pendleton, respectively. The answer to the second question is unclear. But there’s still a backstage intrigue surrounding the mystifying announcement of Palin’s candidacy, and a certain entertainment value in seeing it removed from context. 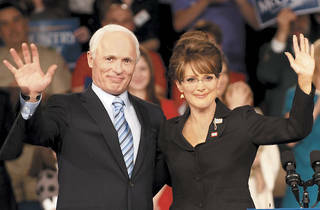 Half-thriller and half-farce, the film, directed by Austin Powers’s Jay Roach and written by Danny Strong (who together mined similar territory in Recount), adheres closely to the book’s description of events; the periphery has supposedly been fleshed out with interviews from campaign staffers and even Palin’s own accounts. The net result doesn’t make excuses for such a reckless pick, but it does humanize the parties involved: the strategists, who were too concerned with creating a dynamic campaign “moment” to bother giving Palin a proper vetting, and even the former Alaska governor, who initially only acceded to a temptation it would be hard to resist. The film’s chief asset is Julianne Moore, who impersonates Palin with terrifying accuracy. (I said it was a monster movie.) Even during such ostensibly comic episodes as McCain’s foreign-policy team tutoring her on geography, the performance goes well beyond Tina Fey mimicry; there’s never a moment where you don’t believe you’re watching Palin herself. The same can’t be said for Harris-as-McCain; his voice is too deep and his makeup unconvincing. The final scenes give him a stature barely visible in the rumpled shell of a man who filled television screens in November 2008. Harrelson, meanwhile, gives campaign mastermind Steve Schmidt (who’s attested to the film’s accuracy) a gravitas belied by his wonkish MSNBC appearances. His showdown with Palin on why she can’t deliver her own concession speech may play like Emmy fodder, but it’s also compelling drama. 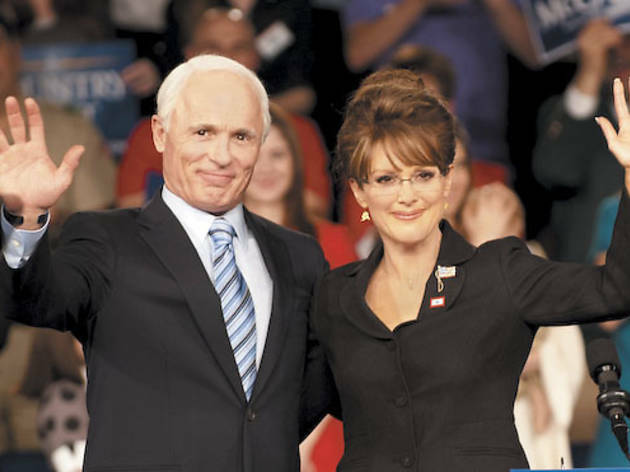 In focusing on Palin, the film inevitably makes those around her look sharp. The movie avoids the episode, described in the book, in which McCain, during his short-lived campaign suspension, insisted on meeting with Obama and Bush to discuss the economic free fall, then showed up with no suggestions. McCain’s staff comes across as the unlikely voice of reason; toward the end, Nicolle Wallace (Sarah Paulson) tearfully confronts Schmidt to say even she couldn’t bring herself to vote.